What is it? A site that aggregates Twitter and social media feeds for thousands of professional journalists. How is it of use to journalists? Journalists often break or share vital information first through social media. 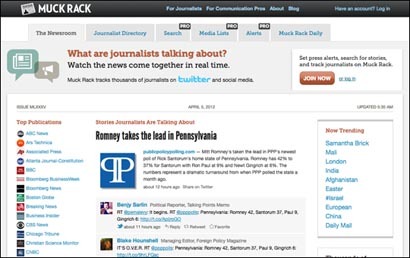 Muck Rack allows you to monitor trending topics among journalists in real-time. Its aim, according to Muck Rack’s creators, is to deliver “tomorrow’s newspaper to you today”. Built around a central directory of verified professionals, Muck Rack now boasts an extensive directory of top journalists from around the world which can be searched by name, publication or even beat. Muck Rack dovetails well with previous Journalism.co.uk tool of the week Press Pass, which organises journalists by beat, media outlet or region. This entry was posted in Handy tools and technology, Social media and blogging, Tool of the Week and tagged aggregation tools, Facebook, journalism tool, LinkedIn, Muckrack, social media, social media feeds, Twitter on April 5, 2012 by James Chapple. How is it of use to journalists? Rippla was launched last month as a tool that tracks how news and information reaches into people’s conversations on social media. It may be interesting to find out that the story with the most “ripples” is currently the Mail Online’s Hilarious video shows cat stroking crying baby and sending him to sleep, followed by George Monbiot’s Guardian comment This bastardised libertarianism makes ‘freedom’ an instrument of oppression, But what is particularly helpful for journalists is the ripples tracker. 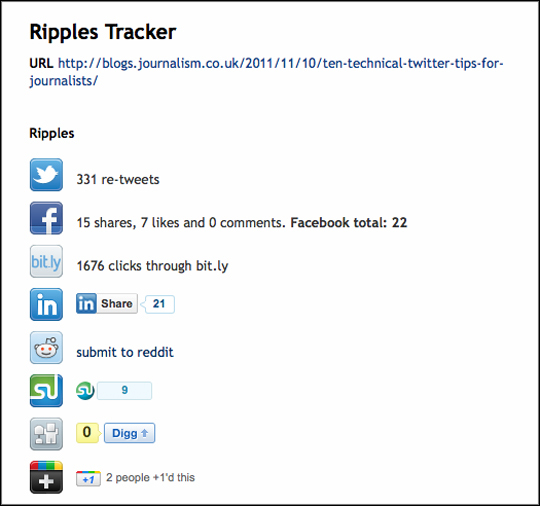 Ripples tracker allows you to enter the URL or a news story and see how many times it has been shared on Twitter, Facebook, LinkedIn and other social networks and find out how many bit.ly click-throughs the post has received. Rippla also offers news sites a widget than can be added (as embedded below), which displays the most socially shared news stories. This entry was posted in Handy tools and technology, Social media and blogging, Tool of the Week, Traffic and tagged Facebook, LinkedIn, rippla, social media, Twitter on December 20, 2011 by Sarah Marshall. Rippla has today launched as a site to track how news stories are shared via social media. Take a look at the home screen and you will see stories generating the most shares on Facebook, Twitter, LinkedIn and bit.ly. The site has been created by journalist and political blogger Sunny Hundal who told Journalism.co.uk Rippla “scrapes news feeds from the UK’s 10 biggest news sites and then ranks them by popularity across social networks. It measures how many ‘ripples’ they’ve created. 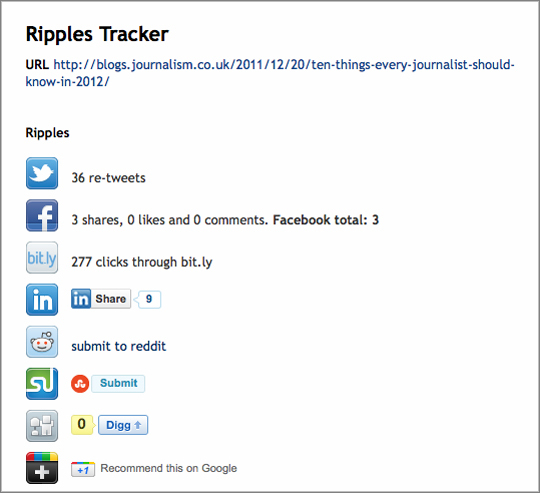 The second great feature of this site is the widget, which allows you to enter the URL of a news story from your site and see the social media “ripples” it has created. First, I want to track how well media organisations do on social media. The site updates and collects the data every hour. Second, the longer term aim is to provide people an opportunity to consume content based on what their peers are sharing / reading, rather than simply based on what the newspaper front-page offers. As you know, patterns of media consumption are changing and we think this is the way its all heading. The site will be in beta for some time while bugs are fixed and functionality is added. This entry was posted in Handy tools and technology, Social media and blogging, Traffic and tagged bit.ly, Facebook, LinkedIn, rippla, social media, Sunny Hundal, Twitter on November 17, 2011 by Sarah Marshall. A study by US company Arketi Group has found 92 per cent of journalists writing for B2B publications use LinkedIn, 85 per cent of journalists are on Facebook, 84 per cent use Twitter. Out of the journalists surveyed, 58 per cent have a YouTube account, 49 per cent have a blog, 28 per cent use Flickr, 20 per cent use Digg, 18 per cent have a MySpace account, 15 per cent use Delicious and 14 per cent use Foursquare, according to this report. Meanwhile, LinkedIn has published advice on its blog for freelancers and those who juggle journalism careers with other jobs. For example, a freelance or part-time journalist may also be a yoga tutor and have to decide whether or not to include details of both careers in a LinkedIn profile. Your first decision is whether you want to feature both careers on your LinkedIn profile. If you think it might be puzzling or even damaging to one of your jobs to feature both on your profile, then simply leave off your other employment. There is no rule that you have to show everything you do on LinkedIn. Embrace the slash mark: Marci Alboher, author of One Person/Multiple Careers, coined the term “slash careerist” or “slasher” to refer to individuals who can’t answer “what do you do?” with a single word or phrase. If you’re perfectly comfortable being a tech salesperson/photographer or a lawyer/SAT tutor, then proudly display this as your LinkedIn headline. You’ll also want to list both of these positions as your current employment in your profile. The way to include more than one job as current is to put the end dates of both jobs as “present”. Note that whichever role began more recently will be displayed first. If, instead, you want to highlight one of your jobs more prominently (e.g., because you’re hoping to land a new job in that field or believe you’ll have more networking opportunities related to that role), then I recommend writing a profile headline featuring that role exclusively and listing it as your only current position. The LinkedIn blog post aso has advice from freelancers who are seeking a full-time position. This entry was posted in Business, Freelance, Social media and blogging and tagged Arketi Group, B2B, LinkedIn, social media on August 31, 2011 by Sarah Marshall. What is it? 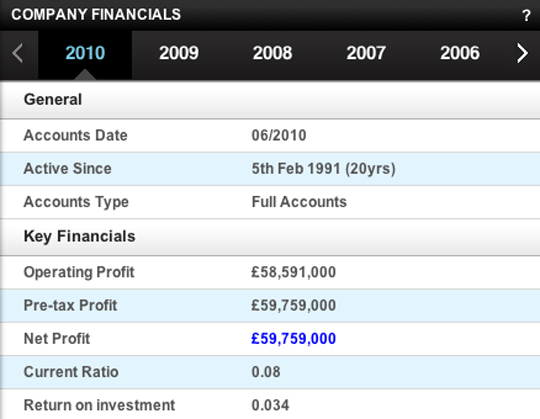 Duedil is a website which launched in April 2010 and allows you to access company stats and figures for free. Gigaom described it as “Lexis-Nexis-meets-Google-meets-LinkedIn”. It’s still in beta but is a kind of social network for company information; transparent data available on a site with an intuitive user interface. You can, of course, access the information via Companies House (for a £1-a-report-fee) but what Duedil does really well is allow you to explore and drill down. Graphs, charts and timelines present current stock information, the number of employees and opinions on the firm, including tweets. Whatever your area of journalism – from fashion to politics to local newspapers – you no doubt have to keep an eye on the finances, details of directors and employee numbers of companies within your field of expertise. What’s really nice is that if you log in with your LinkedIn profile, it automatically suggests companies you might be interested in. Even if you never use Duedil for journalistic research, it’s worth exploring and curiously addictive once you start browsing. 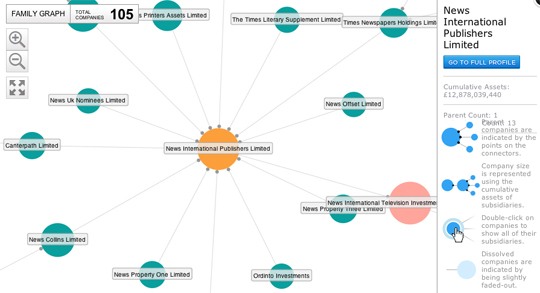 Here’s an example: Journalism.co.uk is interested in following newspaper groups, media organisations and tech companies. Let’s take News International Publishers Ltd. You can click to see various details. For example, you can click on the financials for various years. 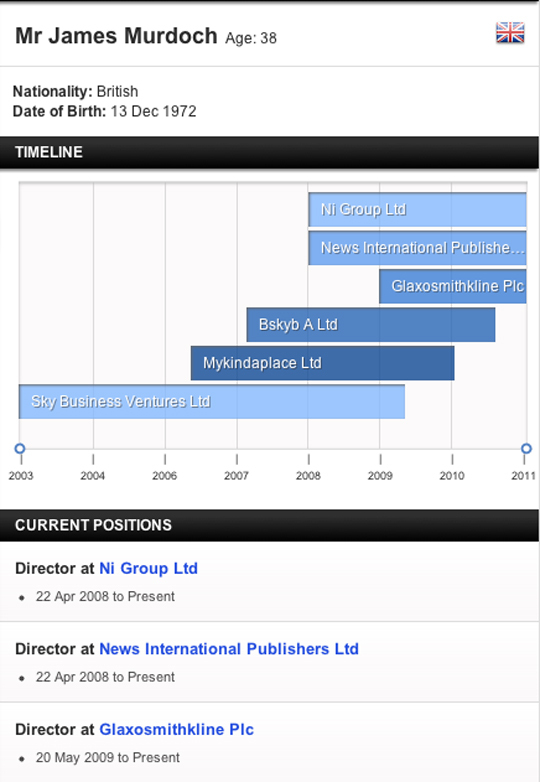 You can then look at the list of directors and find James Murdoch’s current and past positions presented on a timeline. Now click on the group graph and see the family of related companies. Under the “opinions” heading, you can also see the tweets that comment on JP. It is worth checking and data you access from Duedil (you can report bad data if you come across it and receive £5 as part of its guarantee). Simply by following companies on Duedil – in the way you would follow people in a social network – you may well come across data to inspire further investigation or information that reveals a connection. This entry was posted in Business, Freelance, Tool of the Week and tagged Duedil, LinkedIn, Online social networking, social media on August 23, 2011 by Sarah Marshall. LinkedIn is growing by two new members every second, according to figures released yesterday (4 August). Around 14 million people joined the business social network in the three months to 30 June. 1.8 new users every second. Revenue for the second quarter was $121.0 million, an increase of 120 per cent compared to $54.9 million for the second quarter of 2010. The results represent LinkedIn’s first quarter as a public company. This entry was posted in Social media and blogging, Traffic and tagged internet traffic, LinkedIn, online traffic, social media, social networking, Web site traffic on August 5, 2011 by Sarah Marshall. Will your next journalism job application be via LinkedIn’s new button? LinkedIn has launched an ‘apply with LinkedIn’ button allowing companies to recruit using the social network. Job seekers can then use the button to submit an application and are able to see other employees of the firm and make contact with them. Prospective employers will be able to see your connections so this new functionality is another reason to get your LinkedIn profile in order and gather a good quality, rather than quantity, of contacts. There are tips on how journalists can best use LinkedIn in this podcast, which includes advice for news organisations setting up profile pages. We’ve put an incredible amount of effort to rethink the job application process from end-to-end to make it a one-click submit for any professional. The first step was simple: put the functionality everywhere our members need it. That means packaging it as a simple button that you can recognise anywhere across the web. We’ve made this simple enough to implement so both companies and developers can easily include it on their corporate websites. Here is the code for adding the ‘apply with LinkedIn’ button. This entry was posted in Handy tools and technology, Jobs, Social media and blogging and tagged job applications, LinkedIn, recruitment on July 26, 2011 by Sarah Marshall. A post on TechCrunch suggests tools such as Google Analytics do not give a true picture of the traffic drivers to your news site. This post by Jonathan Strauss argues Twitter drives perhaps four times as much traffic to sites than Google Analytics suggests. It demonstrates how Twitter traffic may be categorised separately by Google, such as when it originates from the tweet button and when it is via Twitter.com. The article goes further and explains that Twitter may act like a TV ad to provide the drip, drip effect of product (or news story) awareness. This happens with other marketing campaigns, too. Often you hear a radio ad, see a TV ad or read an article in a magazine and you type the results into Google to find out more details about the product or service. The problem is that marketers assume that Google drove the traffic. They did not. So you ramp down your TV or print campaigns and suddenly your search volume goes down. The post also questions whether LinkedIn should be seen as such an important traffic driver after this post on TechCrunch reported LinkedIn drives more traffic to its site than Twitter. Many tweets are now being sent to LinkedIn and then the publisher assumes that the source of the referral is LinkedIn. In some ways it is because that’s where your user engaged the content. But get rid of the tweet and you get rid of the referral traffic in the same way as I described the loss when you cancel your TV commercial. So when I see MG Siegler announce that LinkedIn is sending more traffic to TechCrunch than Twitter – I’m not so sure. I understand why he would think that – Google Analytics tells him so. But I’ll bet a hefty amount of LinkedIn clicks were originated on Twitter. And I’ll bet a whole lot of TechCrunch “direct” traffic is from Twitter. LinkedIn may be powered by Twitter and that should be recognised. LinkedIn Today should not be discredited so easily, however. Success for a site with LinkedIn Today depends on it striking a deal with the business development team at LinkedIn and becoming one of its preferred industry sites. Getting your news on LinkedIn’s aggregated news site which launched in March makes a notable difference. BBC News is one of the sites on LinkedIn Today and has seen a tenfold rise in traffic in the last six months, rising from around 20,000 referrals in January to more than 200,000 referrals from LinkedIn in June. In order to get a clear picture of your social referrals, the article on TechCrunch states you need a unique URL for each share behaviour. So if you click on a ‘tweet this’ button on a website to send an article to your friends, that link needs to be individual to you and to that exact share instance. By making the URL link unique to its point of generation you can then track it better as it spreads to other sites. And importantly when anybody else then shares the link to this site it maps out a “parent/child” link relationship. So if the original tweet was on Twitter and then somebody builds a ‘tweet this’ from a product like LinkedIn, you can still tell that the original source of the the story was Twitter. Call it, “last mile social media attribution” and when you’re a brand spending money on products and marketing you need to know this. Many sites understand the exact value that reader brings. And if, say, a referral from Facebook or Twitter results in less time on the site and fewer page views than a reader coming via Google, they are less valuable to you if you make your money through advertising. At a recent conference organised by ABC, Ashley Friedlein, CEO and founder of Econsultancy explained how his firm has given a monetary value to each reader coming via Twitter, Facebook, email referral, direct mail, etc. A referral from Twitter for consultancy is worth 11 pence, a reader coming from an email is worth 58 pence, and direct mail brings a higher value to the company, Friedlein explained. It is clear that much depends on having very accurate analytics. The TechCrunch article suggests awe.sm, another option is Twenty Feet. But it’s worth remembering that “the story is never quite as simple as the data might lead you to believe”, as Strauss said in the TechCrunch post. This entry was posted in Social media and blogging, Traffic and tagged analytics, econsultancy, google analytics, LinkedIn, TechCrunch, twenty feet, Twitter on July 15, 2011 by Sarah Marshall. Traffic from LinkedIn to BBC News has jumped from around 20,000 referrals in January to over 200,000 in June, the BBC has revealed. “Referrals from LinkedIn have increased rapidly over the past few months, but they’re nowhere near the level of referrals we get from Twitter,” a spokesperson from the BBC told Journalism.co.uk. The figures suggest the dramatic rise in LinkedIn referrals – from 41,278 in April to 164,869 in May – is due to LinkedIn Today, LinkedIn’s aggregation news site which launched in March. LinkedIn Today has been attributed by TechCrunch as the reason why LinkedIn is now a more important traffic driver than Twitter for its site. Those stats that have been further debated in an article on TechCrunch this week, which questions LinkedIn as a traffic driver as it is powered by Twitter. “Get rid of the tweet and you get rid of the referral traffic,” the article states. The LinkedIn share button being added to many news sites also deserves recognition as a traffic driver. Line graph of Twitter and LinkedIn referrals to BBC News. Click on the visualisation to see exact the figures. LinkedIn Today features industry news for sectors such as ‘online media’, ‘public relations’ and the ‘publishing industry’. LinkedIn users can also follow particular news sites, such as BBC News, the fourth most popular website in the UK, and the only UK-owned website out of the top four. It is curated by people within that industry based on shares on Twitter and LinkedIn. So a story becomes top story when enough people within the industry retweet and share it. In order to become news source on LinkedIn today, news sites must contact LinkedIn’s business development team. BBC News may have received a boost from LinkedIn Today but unlike for TechCrunch, which is a great fit for LinkedIn with its mix of technology and business news, the BBC site has a much wider scope. That is perhaps why the stats show that last month Twitter provided five times as many readers to BBC News, with more than one million referrals a month. There is more on LinkedIn and how journalists can get the most out of the social network in this week’s podcast. This entry was posted in Online Journalism, Social media and blogging, Traffic and tagged BBC News, LinkedIn, Twitter on July 15, 2011 by Sarah Marshall. Here are three different ways to get a daily news round-up of stories as shared by your contacts within your social networks. All three are good options to get tailored, relevant news on days when you do not have time to closely follow your Twitter stream. LinkedIn Today is powered by Twitter and LinkedIn to provide a tailored news site containing news from a choice of industries, including publishing and online media, plus news as shared and tweeted by people in your networks. You can also save articles for later and have LinkedIn Today sent to your email inbox to give you a daily digest. It launched in March and has been credited with making LinkedIn the second most important source of traffic referrals for TechCrunch. Summify also provides you with top stories as decided by contacts within your networks. It will collate the five top stories as decided by your Twitter, Facebook and Google Reader feeds. You can alter how many top stories are sent, whether your receive them by email or as a direct message on Twitter and what time of the day you want your summary created. XYDO curates news based on your Facebook and Twitter feeds. You can also vote an article up or down, which will influence the articles promoted to your contacts and you can receive the article list by custom RSS, email, tweeted links or Facebook. There are more details on XYDO and how it can be used by journalists at this link. 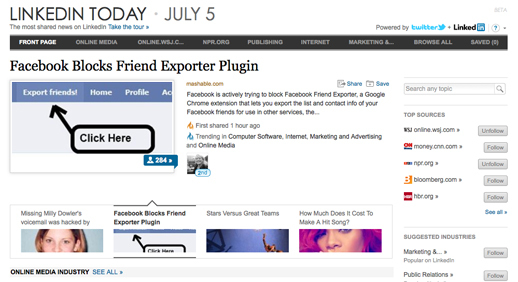 This entry was posted in Handy tools and technology, Social media and blogging and tagged LinkedIn, linkedin today, summify, xydo on July 6, 2011 by Sarah Marshall.